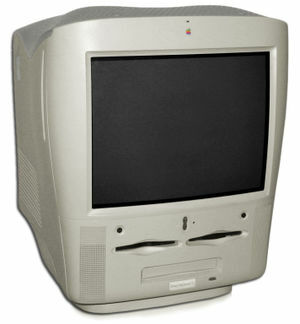 The Power Mac G3 All-In-One, probably the last Macintosh to be compatible with Creatures. Creatures was originally published for two platforms - Windows 3.1/95, and Mac OS 7.5, but the latter port was of a low quality and suffered from many bugs. It should be noted that the game does not run on modern Mac machines - it only works on a Power Macintosh running System 7 or Mac OS 8. Note that the OS requirement means it doesn't work under Mac OS X's 'Classic' mode, which is MacOS 9. Nor is it known to work under any Mac emulators, since most of them don't emulate the required PowerPC processor (as used in PowerMacs and above), and the rest don't manage to run the required system versions reliably. The PC version, however, runs acceptably on a modern Mac using Virtual PC. You have to set the System font to CHICAGO in the APPEARANCE CONTROL PANEL. Restart the computer and the Health Kit should work just fine. For added performance improvements, also turn off the system wide platinum appearance in the appearance control. After this scrolling should work better in Creatures. This page was last modified on 3 November 2017, at 20:54.